What I’ve produced for you here is a dish I concocted for the breakfast menu at the restaurant. The idea here was to incorporate key elements of a typical breakfast—meat, potato, egg—and produce a different interpretation. Typically, gnocchi is a mixture of potato, flour, and egg (often cheese like Parmesan, as is employed here), but you can also use other starchy products—butternut squash, for example. Another advantage of these simple dumplings is pre-poaching the gnocchi ahead of time, and then refrigerating or freezing for later use. For those of you who recently joined my list of readers: thank you—thank you for participating in and supporting this culinary conversation. 1. Place potatoes in pot of water; bring to a boil and immediately reduce to a simmer; cook until potatoes are tender when inserting a paring knife through center. Remove potatoes from water and allow to rest for several minutes. While potatoes are still warm, remove skins. Place skinned potatoes in food mill and mash until smooth. Add in eggs, flour, Parmesan cheese, and season with kosher salt and cracked black pepper (may need additional flour if dough is too moist). On a lightly floured work surface, knead gnocchi dough for several minutes until dough is smooth. Place in a bowl, cover with plastic wrap. Prepare gnocchi poaching liquid: place a large pot of salted water on high heat; bring water to just below a simmer. 2. Divide dough into four equal portions; roll out each portion into a long rope; using a knife or bench scraper, cut knuckle-size pieces, and use the tines of a fork to make striated indentions in the dough (but don’t smash them—keep them tubular and oblong); reserve the pieces of gnocchi on a floured sheetpan. 3. Once gnocchi is shaped, gently lower into poaching water. Cook gnocchi until dough floats, and continue cooking for approximately five to seven minutes (or until thoroughly cooked). Using a bowl strainer or slotted spoon, remove gnocchi and reserve on an oiled sheetpan. 4. Bring one quart of water and one tablespoon white vinegar to approximately 180° F for poaching liquid. Gently crack a large egg and lower egg into poaching liquid. 5. Place cherry tomatoes in a sauté pan or sheet pan and place over heat or in an oven to blister skins; reserve. Meanwhile, in a sauté pan, fry bacon, rendering fat; remove bacon, drain on towel and chop; reserve. Add roughly a cup of prepared gnocchi to sauté pan and brown in hot bacon fat. Toss in parsley, green onion, and season with kosher salt and cracked black pepper. 6. 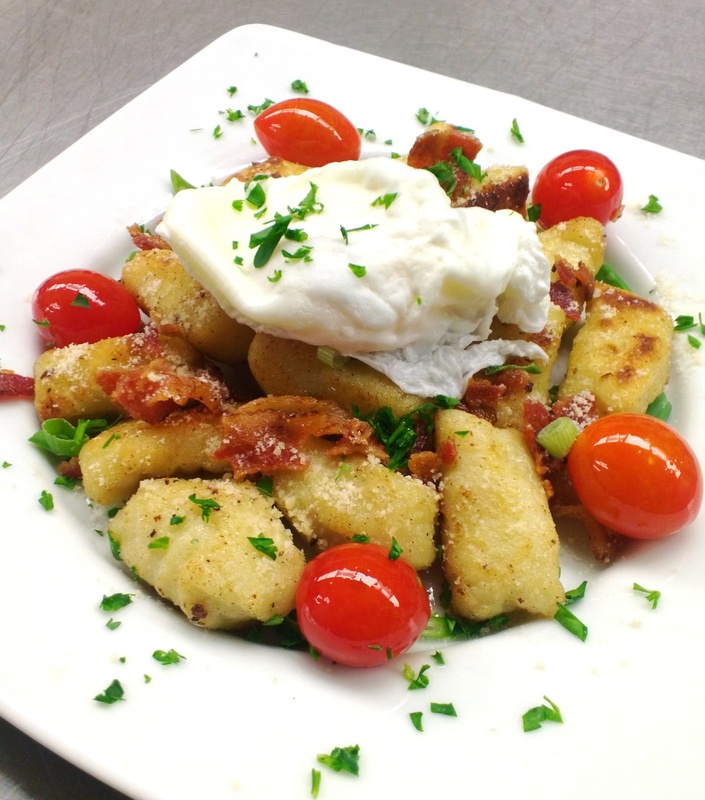 Plate gnocchi, garnishing with Parmaesan cheese, parsley, green onion, and cherry tomatoes. Gently place poached egg on top of gnocchi.